In days gone past, windows had subframes, and doors just wide enough to deliver furniture. Historically, some European countries had window taxes, and this influenced the designs that settlers brought with them. Moreover, construction methods could not sustain unsupported openings until a few decades ago. Historically, window design was a long and arduous process that brought together a number of materials and components and was also paramount in maintaining the style and constructive integrity of the house. Thanks to a recent engineering breakthrough, our frameless sliding glass doors now stretch seamlessly from corner to corner right across the room. Did you notice how imperceptible the joints are between the sections? That hasn’t always been the case. Windows were often times very expensive (especially in Europe), mostly because of the scarcity of available resources and the elaborate glass technology required of early window designs. In early times, a window usually connoted a general opening cut into the roof or wall covered by translucent material, like an animal horn, thin slices of marble, or pieces of glass. Windows also developed differently throughout varying regions of the world - in ancient China, Korea, and Japan paper windows were economical and widely used. Thanks, in part to industrial plate glassmaking processes, modern floor-to-ceiling windows are made possible and frameless windows take shape. Stronger material construction and less physical impediments obstruct the views of modern frameless sliding glass windows and doors. We should also mention the benefits of enjoying being virtually outside regardless of the weather. Frameless sliding glass doors open up possibilities of watching weather conditions develop. Imagine seeing thunderclouds appear, lightning flash, thunder roll, and cloudbursts pour down as if you were in a movie house. It’s increasingly difficult to believe some people actually thought clunky cottage-style windows were cute and cozy. Early attempts to open up the full widths of rooms included hinged ‘French’, and framed stacking doors. These primitive devices robbed their owners of their interior and exterior space because they intruded into it and this space had to be clear at all times. In a remarkable breakthrough, Cover Glass USA’s frameless sliding glass doors are an incredible 1 3/4" thick, and they nest seamlessly together as you close them. 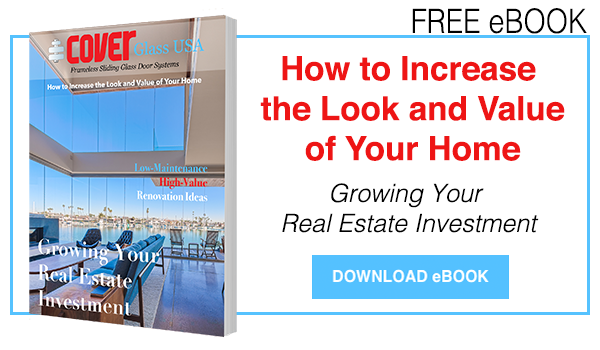 This neat development means your home appears more spacious when it comes to retaining value. Being 100% glass means you only have to clean this, and it goes so quickly without the frames. When you install frameless sliding glass doors you say goodbye to varnishing wood, or endlessly trying to keep aluminum frames looking the way they did when they were new and shiny. That’s because Cover Glass USA wants you to enjoy your home or workspace, and nothing else. Our engineers went to great lengths to design a system that accommodates 45°, 90°, 120°, 150°, 160°, and 180° angles. We are even able to work with curving facades as in the picture. Your neighbors will wonder where the glass went, and we have solutions for many applications. The beauty of our product is, now you see the frameless sliding glass doors and now you don’t. You may not have even noticed we opened the doors wide for the second photo! Imagine what a difference this amazing product could make to your lifestyle. And your enjoyment of being in your own living space with everything laid out before you.